Fairy Tail: Endless Skies has officially closed its doors and will not be re-opening. 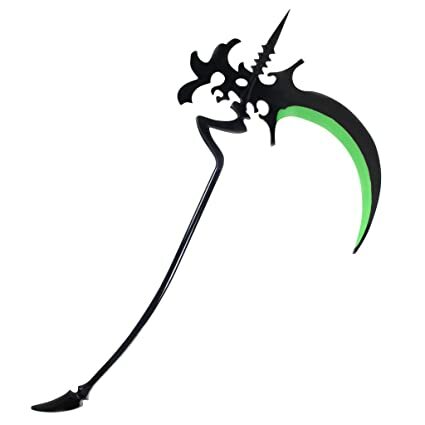 Description: This scythe was given to Morphina by her God Father, Ryoto, in order to grant her her magic. However, she was displeased with the gift preferring to take targets on from a distance. As such, she set about transforming the scythe into a magic rifle. Now, Orcus Nex has two forms (neither form is superior over the other and the base damage doesn't change). The rifle can fire shots accurately up to 400 meters. With a little push, Morphina can transform Orcus Nex from the rifle into the scythe though the transformation takes a few seconds. The scythe still has a tendency to get jammed when transforming back and forth especially when it takes damage. This is something Morphina is trying to fix while also adding a form that is more middle range. Description: Orcus Nex must be within its Scythe form to use this ability. A ring of black emits out from the tip of the scythe moving out to a diameter of 400 meters. No one is harmed from touching this black ring. Once the ring stops at 400 meters, black shadowy figures begin to rise from the area within. These shadowy figures latch onto any living creature within the spell's area. They begin to drain the life from them, doing moderate damage over time. They also drain 30% of a creature's physical strength and speed. Once the creature is drained for 4 posts, they are dragged beneath the earth, leaving only their head free. This paralyzes them for 4 posts. The shadow that drained them reappears within the area to explode for heavy damage within 1 post. The full shadows aim for destruction over killing others. Their explosions aim to take out buildings, trees, etc. over killing people. However, they will aim for people if everything within range has been leveled. Description: Orcus Nex must be in the rifle configuration to use this ability. When the trigger is first pulled on the rifle once the spell is activated, flames roar across half the range of the spell. Those flames continue to burn across the range, transforming into something the viewer is scared of. The flames begin to move, chasing living creatures and leaving behind a trail of fire. When the flames touch a living creature, they do heavy damage. They also leave behind a burn that reduces physical and magical damage done by that creature by 30% respectively. The flames can only travel within a 400 meter diameter from where the wielder first pulled the trigger. Nonliving materials that aren't worn or held are consumed by the flames, leaving behind only a pile of ash. Description: Orcus Nex must be in the scythe form. A black fog ripples out from the scythe covering a circle with a diameter of 300 meters. Those stepping within the fog feel apathetic to life, want nothing more than to simply stop (plot only). The fog seeps into those that step into it draining their speed away by 60%. The fog also does moderate damage to those that stay in it longer than 1 post. visibility is low while inside the fog. Most cannot see more than 5 meters in front of them. Description: Orcus Nex must be in the rifle form. When the trigger is pulled for the first time after the spell is activated, an orange tendril shoots to half the range of the spell (150 meters). The tendril splits, spreading in a circle. The tendrils can only travel 150 additional meters from the point of origin i.e. creating a circle 300 meters in diameter from where the caster pulled the trigger to the edge of the circle. These tendrils use moderate damage and pull 30% strength and speed respectively from those touched by the tendrils. Those touched by the tendrils are assaulted by images of the sins that affect them most deeply. They see both those images and whatever is presently around them. Duration & Cooldown: Duration = 11. Cooldown = 13 Only have a question for this, feel free to ignore if I'm correct in assumptions, just wanna be sure I understand it fully, but your duration is 11, and the numbers in your description add up to 9? Are the other two posts when the ring goes out? Description: Orcus Nex must be in the rifle form. When the trigger is pulled for the first time after the spell is activated, an orange tendril shoots to half the range of the spell. The tendril splits, spreading across a circle that is 300 meters in diameter. These tendrils use moderate damage and pull 30% strength and speed respectively from those touched by the tendrils. Those touched by the tendrils are assaulted by images of the sins that affect them most deeply. They see both those images and whatever is presently around them. My only issue with this ability, is it sounds like it can go up to 450 meters away from the weapon. Could you lower the range of the initial shot, or the diameter that it goes please?